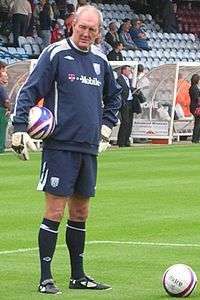 Corrigan pictured whilst coaching West Bromwich Albion goalkeepers in 2007. Joseph Thomas "Joe" Corrigan (born 18 November 1948), is a former football goalkeeper who played in the Football League for Manchester City, Brighton & Hove Albion, Norwich City and Stoke City as well as the England national team. Corrigan began his career at Manchester City making his professional debut in 1967. In the 1969–70 season, he established himself as the first choice 'keeper at Maine Road, taking over from the ageing Harry Dowd. He spent 16 seasons at Manchester City, winning the UEFA Cup Winners' Cup and League Cup twice, while also earning nine England caps. He left in 1983 to play for the North American Soccer League's Seattle Sounders, then returned to England for spells with Brighton & Hove Albion, Norwich City and Stoke City. A neck injury forced him to retire in 1985. Corrigan joined Manchester City as a youth player in 1966. He made his debut in 1967, in a League Cup match against Blackpool. Corrigan was an understudy to Harry Dowd on City's 1969 FA Cup winner. Corrigan then established himself in the first team during the 1969–70 season, and was part of the Manchester City team which won a cup double of the UEFA European Cup Winners Cup and the League Cup. He was also a member of the 1976 League Cup winning side. His debut appearance for England came on 28 May 1976 against Italy, the first of a total of 9 caps, and he was part of the England squad for the 1982 FIFA World Cup. He would undoubtedly have played more time for England if his chances had not been limited by Peter Shilton and Ray Clemence. Corrigan also appeared for Manchester City in the 1981 FA Cup Final defeat by Tottenham Hotspur where he was named as man-of-the match. In total Corrigan made 592 appearances for Manchester City, a figure beaten only by Alan Oakes, and a club record for a goalkeeper. He also won Manchester City's Player of the Year award three times, a feat matched only by Richard Dunne. He is remembered as one of Manchester City's best goalkeepers along with Frank Swift and Bert Trautmann. Corrigan was sold in 1983 to American club Seattle Sounders for £30,000. Corrigan stayed in the US only a few months, making 29 appearances before returning to England with Brighton. At the end of his career he also had spells on loan at Stoke City and Norwich. After retiring from football, Joe Corrigan was for a time the Goalkeeping Coach at Liverpool, from 1994 until the arrival of Rafael Benítez in 2004. On 21 September 2004, Corrigan joined the coaching team at Chester City but moved to become goalkeeping coach at Stockport County on 5 October 2004. In February 2005, Corrigan joined West Bromwich Albion. Joe Corrigan retired at the end of the 2008–09 season. In February 2011 Corrigan came out of retirement to join Hull City as goalkeeping coach, replacing Mark Prudhoe, who had been criticised by some Hull supporters for his coaching methods. Corrigan left his coaching role at Hull City in August 2011 after being involved in an unspecified incident with Jimmy Bullard on a pre season trip to Slovenia, the latter being sacked as a result. A. ^ The "Other" column constitutes appearances and goals in the Anglo-Italian Cup, Anglo-Scottish Cup, FA Charity Shield, Texaco Cup, UEFA Cup and UEFA Cup Winners' Cup. ↑ "Staff Profile: Joe Corrigan". Liverpoolfc.tv. Retrieved 8 October 2007. ↑ "Flown from the Nest: Joe Corrigan". ex-canaries.co.uk. Retrieved 8 October 2007. ↑ "West Brom goalkeeping coach Joe Corrigan to retire after 42 years". Birmingham Mail. Retrieved 17 May 2009. ↑ "Hull City: Signing young guns is key to our future, says Adam Pearson". Hull Daily Mail. 2 February 2011. Retrieved 2 February 2011. "Joe Corrigan". Manchester City Supporters Homepage. Retrieved 16 January 2006.